The primary benefit of roof top solar systems in the industrial or commercial sectors is to save a significant amount of money that would have otherwise have been spent on buying electricity from the local council over the life of the solar system. However, many clients are also interested in using solar power as a back-up power supply system in the event of a power failure. Grid tie inverters are designed to immediately shut down in the event of a council power failure. This is partly for safety, your solar system can potentially feed power back onto the wider grid during a power failure, or after the council has shut the network down for maintenance. Technicians would be exposed as they handle conductors which they thought were safe, but were in fact still receiving power from your solar system. Clearly this would be very dangerous. Another reason why a grid tie inverter shuts down during a loss of power from the council is that it needs to synchronise with an external AC power source. When that external power source disappears, it cannot synchronise and thus shuts down. The only way to use a grid tie system during a power failure would thus be in conjunction with another back-up power source such as a generator. Many companies already have back-up generators installed. In the event of a power failure, the building’s network must be completely disconnected from the council grid before its safe to start the generator. Once the power supply from the generator has stabilised, the grid tie inverter will detect the new external power source and re-start automatically. 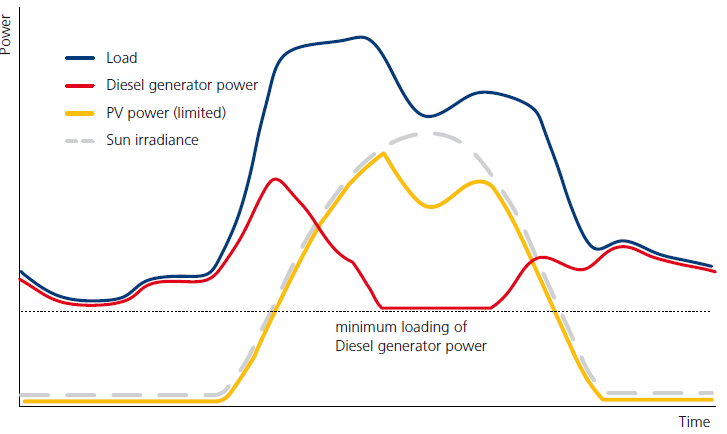 In this configuration, the power from the solar array will reduce the power required from the generator and thus reduce the cost of diesel consumed during the power failure. However its not good practice to run a diesel generator at too light a load. For this reason some sophisticated grid tie inverters can be programmed to scale back their power supply when they detect that the diesel generator is running at too light a load. Another method of using solar power as a back up system is to use a conventional solar inverter instead of a grid tie inverter. Conventional solar inverters are designed to simply convert DC power supplied by the solar array into AC, they do not synchronise with the external grid. This means they operate in whats known as an “island”, or “off grid” mode. They are essentially completely separate from the external grid. In this configuration, batteries are normally required. They provide a buffer of stored energy for later use. Power generated by the solar array is obviously strictly according to the sun’s schedule. Your daily energy demand profile is unlikely to match that 100%, and so it becomes necessary to store energy in batteries. Batteries are able to effortlessly supply very large instantaneous current spikes. Some processes, such as starting an electrical motor, result in very large short term current spikes being drawn by the motor. Without a battery in the system to supply that, its very likely that the solar charge controller will be damaged as it tries to supply a current spike it was never designed for (the solar charge controller is designed to charge batteries at very even steady pace). 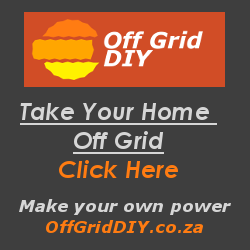 As a comparison – batteries are not required in grid tied systems because any large short term current spikes which cannot be supplied by the grid tie system are supplied by the council/Eskom grid instead. Unfortunately batteries are very expensive, so its usually financially impractical to use these type of systems on a very large scale. However its quite feasible to use systems like this for a few small crucial requirements in a company such as a back-up power supply to the computer system, or power for alarm systems or electric gates and doors etc. In that way, one can think of this type of system as a “solar powered UPS system”, where the solar powered UPS system can supply power indefinitely during extended power outages. Please Contact Us, if you require more information.